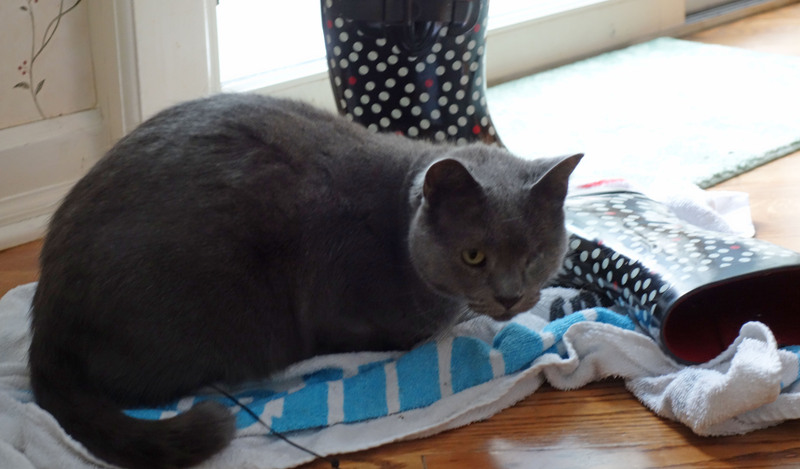 Here is Gracie keeping my boots warm between pond trips. Pond woes – Something wonky happened to our outdoor electrical outlet which shut down the pond bubbler. It’s important to keep an open area in the pond so the gases can exchange and the fish don’t suffocate. At 7 a.m. on Tuesday I was out (with the temperatures hovering around 0 Fahrenheit) with buckets of super-hot water to open up an area in the frozen pond. We got the electric on by disconnecting something else and thought all was good. But the the next morning it was the same drill (and it’s getting pretty old at this point). We rigged up an extension cord to another outdoor GFI outlet and all seems good now. Temperatures are expected to climb this coming week so I’m hoping that the bitter cold is over. We will need to figure it all out later. Like when it’s warm. Silver linings – Lugging hot water was enough exercise. I excused myself from further movement for the rest of the day. Yes, I did treat myself to a second mocha latte. Reporting from the ancestry rabbit hole – Over the past few months I’ve received email from six different people asking about ancestry connections. Two had positive results and four didn’t (at least from anything as recent as the 1850’s). One person I knew when he was a child. He’s a second cousin and lives in another state. The other was the granddaughter of another cousin. When I was young, there were picnics and parties where all the cousins got to know each other. As we got older, that stopped. There were too many cousins and with the older generation dying off, no one kept it up. Now it’s fifty years later and I don’t remember all my cousins nor do I know what happened to them all. So the outcome? – Although I’ve connected with two cousins, we don’t have much in common. I haven’t heard anything from the first one since the initial contact and I doubt I’ll hear much from the second (that contact was more recent). Reconnecting with relatives doesn’t mean getting new best friends. In some cases it’s just filling in a blank on your genealogy chart. Punxsutawney Phil! 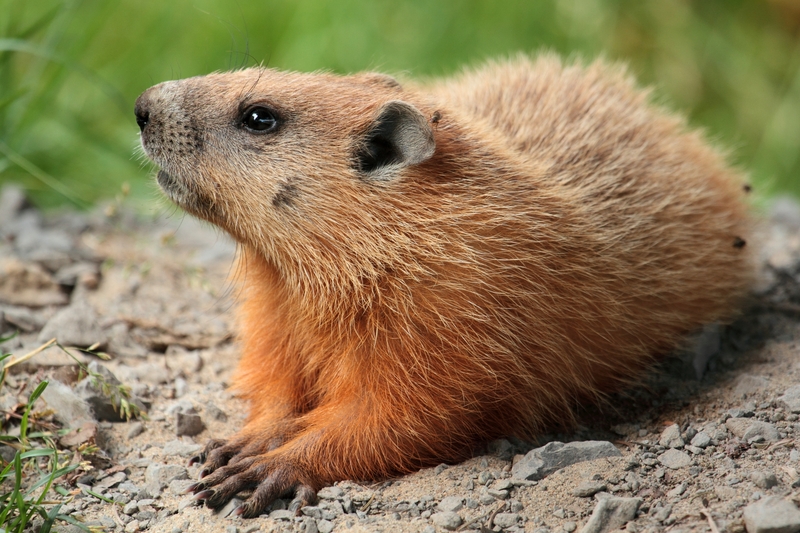 – There is a local custom that if the groundhog climbs out of his burrow on Feb. 2 and sees his shadow there will be six more weeks of winter. Makes no sense to me. If he sees his shadow it means the sun is out and that’s warmer. Anyhow the little rodent did not see his shadow (so “they” say) so he predicted an early spring for us. First time in years. People are rejoicing. Hey, when people are looking for hope, they will grab onto anything, even a rodent! We already know the meteorologists aren’t always on mark. This entry was posted in For Animal Lovers Only, Growing Up, Humor, Other People, Random Five, relatives and tagged ancestry, bitter cold, electrical problems, Pond, pond freezing over, Punxsutawney Phil, reconnecting with old friends, storms, weather by Kate Crimmins. Bookmark the permalink. For the sake of all who are in this freezing winter, I really do hope that early spring is getting closer! I am really sorry that you’ve had to address the pond’s issues in such terrible weather. How you are ever able to even leave the warmth of the house is amazing to me. LOL! Carrying heavy buckets of water definitely counts as a work out – glad you treated yourself afterwards! We are having our summer now and it is super hot – I’m trying not to think that autumn is getting closer. I’ve been reading about super hot summers in the southern hemisphere. Wow! I hope we have a moderate summer. Last year was very hot and wet for us. Not crazy about doing the bucket brigade again ever! I think that cold weather played havoc with lots of things related to outdoor. Too bad Phil is usually wrong but if the last two days was any indication, I’m all in on believing him. This year I’m loving that little rodent! You are overthinking it. It’s a day to celebrate something and what doesn’t matter as long as it’s with some delightful food or drink. The little rodent wants us to be happy. I just want longer days. Light until 8 or 9pm every night like it is in the summer and I could put up with an arctic vortex for months. Of course I don’t work out of doors, so my life isn’t too terribly disaffected by the deep cold. I prefer longer days too. When it gets dark early it seems to signal to my body that it’s time for bed. I also like sunshine and warm weather. As for Phil, I BELIEVE! I was fondling summer shoes! I hope you get your pond problem fixed easily. I loved the pond and can’t imagine it freezing over. I should take a picture of it. I only take pictures when it’s really pretty with blooms. Yay for the groundhog! That tradition always makes me smile. Sorry for the glitch with your fish pond – hope all the fish are still OK? And glad to hear that you got to reconnect with some relatives, even if it isn’t going to lead to new closeness. It’s always good to know what’s up with family! We’ll see about the fish in the spring. Fingers crossed. I never understood that whole groundhog thing. I did enjoy the movie, though 🙂 I wonder if the same people who believe in the rodent don’t believe the scientists about climate change. Good luck with your pond (and the fishies in it). The rodent tale is much older than the people who don’t believe scientists. Then again, people believed weird things in the middle ages. Hopefully it warms up soon for you. It’s 70 degrees in OKC today! I was shocked. I just took Elsa for a stroll around the house. Noticed the green fronds of Iris coming up. It thinks it’s Spring I guess in spite of the freeze. It has been a freeze n’ thaw winter so far here in VA.
Yep, we call it bi-polar. You’re a good fish mom! Between the heron and this electrical thing, I sure hope there are fish in there. The groundhog legend: If he sees his shadow we gets frightened and jumps back into his hole for another 6 weeks. Ergo, 6 more weeks of winter. If not, he stays out and we enjoy an early Spring. I think the stock market has a similar philosophy. They are both wonky if you ask me! Sometimes even the relatives you know aren’t best friends – LOL Hope the pond thing gets sorted out. I can’t imagine having to deal with it in that cold weather! It doesn’t normally happen. Somewhere there is a short in the electrical circuit. We will wait until much warmer weather for troubleshooting. In the past, I haven’t put much faith in old Phil. All I know is next week will be mild and we could hit 73 on Thursday! Woot! Have a great Sunday, Kate. I’d love to see 73! We are hoping for mid to high 50s and that will be delightful! I enjoy your pond from afar. Through you I’ve learned what an effort it is to keep it going. I also find your forays into genealogy informative, too. I agree that knowing that you’re related to someone doesn’t mean they’ll give a care about you. It’s often all about putting the pieces together in a way that pleases you– or at least that’s my take on ancestry at the moment. The pond really isn’t much work. Much less than a pool but nothing is no work. Even as I got the last email I realized that we weren’t close as kids (he’s younger than I am by a few years which is a lot in kid years). If we exchange a few emails about his siblings that will be good and if not, nothing ventured. It is astonishing this whole Groundhog Day thing. Faith is one thing but that old yarn about the groundhog being a predictor of weather seems just plain goofy. Professionally trained meteorologists can’t accurately predict and we’re supposed to trust a rodent? Puleez. It’s discriminatory against wooly caterpillars.😇Hope your pond issues get squared away soon and easily. Electrical issues frighten me. They lust after the checkbook. As do car batteries and other things that go wonky in the cold. Not sure but I think the groundhog thing is an old German tradition or a reason to celebrate in an otherwise dreary month. Your are correct, it is a German custom, but they at least they used a badger. Who’s gonna complain at a badger? Didn’t the rodent predict an early spring last year too?? I remember all sorts of memes about how wrong he was and “wanted” posters up for him last year! Maybe. I don’t really remember. I just remember always being annoyed about late or no springs. So how large does a pond have to be to not worry about gas exchanges when it freezes over? I’m thinking of a pond I ice-skated on when I was a kid, plus the frozen lakes in New Hampshire and wondering how those fish survive. Zero degrees and boiling water — you are a trooper, Kate! I don’t really know but it may also have to do with the number of fish in the pond. We also have large ponds here that freeze over. We are overpopulated (I have horny fish). My pond is relatively small 5′ x 11′ and the pond place was very emphatic about making sure there was an opening in the ice. Living in WNC we had to buy a floating pond heater as the bubbler just couldn’t do it all in extended cold days. For the life of me, I can’t remember the company we bought it from. We had the floating donut (as we call it) and that seemed to not be working. It was the first item we detached from the outdoor outlet. We could flip the breaker switch and we thought all was good but it tripped again and froze the pond overnight. My friend has one that has a light on top so you can tell if it’s working. I may look into that. I like to have two different devices going in case on goes out. Now it seems like I should have two different electrical circuits too. It was awfully nice of you to take care of the fish in near-zero weather! That totally counts as cross training. At our house, vacuuming, mopping, and washing a car counts as cross training. I like the way you think! When I garden I don’t do “formal” exercise either and I end up with more sore muscles! Warm here, too. Everybody is out in their shorts riding their bicycles. We’ve had an 80 degree temperature swing in just a few days’ time. And in a few more, winter will return again, with snow and ice. I don’t believe that dratted groundhog! We haven’t warmed up yet. Hopefully by Tuesday. I’m not in touch with any of my cousins even though one turned up at Mum’s funeral last year and didn’t make herself known to me. My sister knew she was there as apparently she lives locally to them. I have nephews I haven’t heard from in decades (nor do I know where they actually are) and great nieces and nephews I’ve never even met. It doesn’t bother me though. Maybe in a hundred years someone will be looking up their family tree , come across me and maybe even wonder who I was. I see my nieces and nephews because all but one is local. When it comes to cousins though, there were well over 50 and the age range was insane. Both of my parents came from large families. I see some of my cousins at funerals but many have already passed. Others moved away (as I recently found out when I got the email). It takes more than being related to stay in touch. I agree with you there Kate.